At the sight of this remake's trailer I punctuated it with a loud raspberry. The though tof anyone having the audacity to attempt remaking such a classic film of unparalleled terror was insulting to me. But, in its defence after watching the film, this reappraisal of the classic early '70s Tobe Hooper horror comes out the other side in tact. 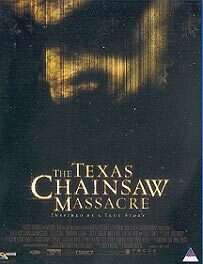 The writers took the basic idea of a group of youngsters crossing through backwoods Texas and falling prey to a family of freaks and inserted their own themes, deleting specific characters and added some others. Thankfully key maniac Leatherface (the chainsaw-wielding son and head butcher of the screwed up family) is untouched. Fortunately the same year (1974) was also kept and not updated to a modern time of annoying American brats ala Scream. A kid and abducted baby is added, the wheelchair shifts from the van of teens to the old man in the house, the female meat hook victim becomes a guy, the freaky hitch-hiker also gets a gender switch with suicidal tendencies etc. The dark design with its hot, musty & grimy locations is effectively conveyed via original cinematographer Daniel Pearl's eerie approach, removing the film from modern glossy slasher crap. The menacing nature of the story also get little touches added to make the viewer care a bit more for the characters as opposed to fresh meat for the killer over whom no tear will be shed. While some rabid TCM fans (not Turner Classic Movies) will be outraged at the gall to remake a classic such as this, I must admit I shared that view until a third into the film - yet it turned out to be a satisfyingly gruesome, shocking, creepy experience which would've been even better had it not been based on the landmark original (which was in part inspired by the Ed Gein serial killings), that fact impossible to ignore. Biel is pretty damn hot and Ermey sadistically brilliant. And as my tense tendons relaxed remake of another classic swung around - George A. Romero's Dawn Of The Dead. Why don't they just remake E.T. while they're at it!